At the end of last week, an LG employee notified members of their forums that the Spectrum’s Ice Cream Sandwich update is ready to be rolled out. All they are waiting for is Verizon to press “Go.” The following day, it appears as if they were trying to prove how ready it is by uploading a new user guide for the device which includes all sorts of Android 4.0 tips and tricks. 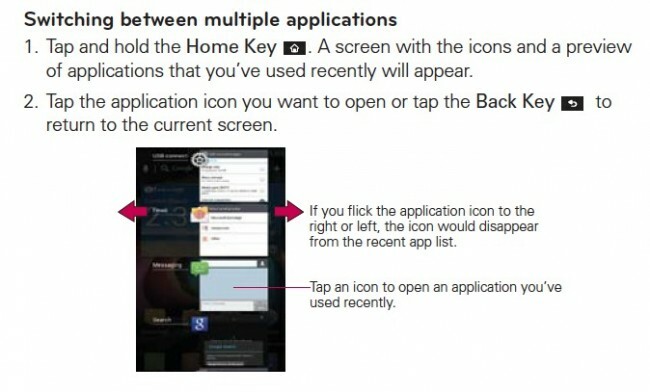 Included in this guide, LG details the standard ICS stuff, like task switching, notification swiping, and simple folder creation. They also talk of new and improved features though, some of which we wish other OEMs would adopt. LG has apparently built in the ability to create or use custom icons (without requiring a 3rd party launcher) and a “Clean View” gesture for temporarily hiding everything on your home screen. From reading through bits and pieces of this new user guide for the Spectrum, you can tell that LG is doing everything in their power to make their phones more appealing, even it has to be through software. Still no word from Verizon on when this update will roll out. If you are keeping track, this would be two Android OEMs that have grown sick of waiting for final approval and went ahead and published details for their Android 4.0 updates, the other being HTC and their Rezound.